CoreFoam Insulation is an enviromentally-friendly, "green" product designed for improving the thermal and acoustical resistance of wall cavities. Foam-in-place insulation is different from many other types of insulation in that it is injected into the block cells while the foam is in a semi-cured, free-flowing state with the appearance and consistency of shaving cream. This allows the foam to flow through the structure until the cavities are completely filled. The foam sets up in a matter of minutes, followed by a final drying period of 2-3 weeks. 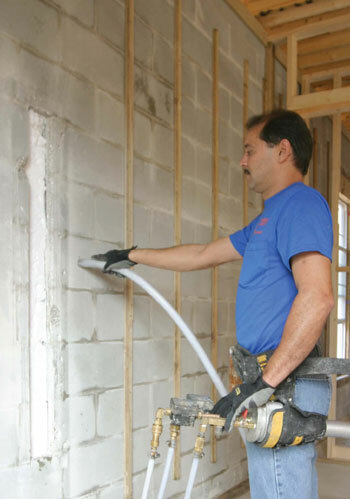 This technique ensures that all the voids in the wall are completely filled, the foam flows through tiny openings and fissures in the wall to completely fill and insulate every possible area thus eliminating any air infiltration. Unlike foam-in-place insulation, rigid board products cannot fill tiny openings in the wall or pipe and electrical openings, resulting in a wall with uninsulated gaps where heat, air and incects can infiltrate. 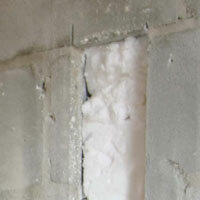 The CoreFoam injected insulation system provides a well-insulated, quiet and energy efficient building.